Thank you for considering and showing an interest in helping us with jesus4usall. Why not chat to us about how you can help spread the Good News around the world? Just click on the Chat window (top right) and if we are online we can start chatting now. You can start by praying for us, all those helping, all those who visit our site and especially those requesting prayers, for themselves or loved ones. You can help by telling your friends and family about us. We already have a "tell a friend" button you can use to invite your friends. You can purchase one of our books, this helps our mission and will enrich your prayer life. If you purchase any books in our collection, then, you can fill in a book review to help others know before they buy how well you rate the book. You can monitor this site and its contents and let us know of any mistakes, or ways of improving its content and presentation, just contact us if you see a mistake here and we will then act to correct any errors. If you are from other parts of the world, would you help in translating this site into your local language, then if you are interested in that as a project, you can help with that, subject to our approval. Register with our Jesus4UsAll community site for free and there you can see more details. You can join our Affiliate programme by becoming an Affiliate Member and earn by recommending people to buy from us. You can help by making a Donation. 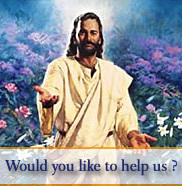 All donations will go into helping jesus4usall succeed in its mission in bringing people to a knowledge of the Love of God and the message of salvation, brought to us through Jesus Christ, our Lord and Saviour. This is not an exhaustive list of how you can help. But if you any ideas of how you can help us that is not listed above then please contact us and let us know today how you can. Thank you once again for your time and interest in helping us and we pray that God Bless You in all you do for the Lord Jesus Christ and that you are always filled with His Spirit of Love, Faith, and Hope, now and into eternity.